Here's a few images from Workshop 2 of the Strathmore Visual Journal workshop series. I'm still working in another journal, so any actual sketching in this journal will wait until I'm finished with the other one. These are just a few prep pages. There were some good tips in this workshop. Here's my first three pages. I used some oriental paper samples and paper that was wrapping some soap I bought a while back. The first two pages were trimmed and the edges of pages 2 and 3 collaged. I really love the way this turned out. I made a pocket in the back. Why didn't I think of this before? I like haven't a pocket in my journals, but I never thought of making one myself out of the last two pages. And finally, a couple of my page preparations. I'll be sketching over these eventually. For the first one, I used an old plastic slide holder under the page and scribbled watercolor pencil on top. 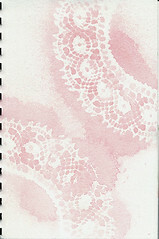 In the second one I put some lace on the page as a stencil and sprayed watercolor on the page. I got a lot of good ideas from this class. The second Strathmore Visual Journal workshop started this month. It's "Start Where You Are" with instructor Linda Blinn. Rather than work on a single page, this workshop focuses on a variety of techniques you can use in your journal. I'll show you later what I've done so far. I got a bit of a late start. That's the nice thing about these workshops. You don't have to start on the first week if you're busy with something else. Just to wrap up Workshop 1, I thought I would show you how the pages progressed during the workshop. Click the pictures to embiggen. progression of page through weeks 1-4. I'm a selfhelp-aholic. I always buying self-help books and downloading eBooks and audio files, more than I can read. Sometime last summer I downloaded an interview with Steven Pressfield on Lateral Action. I've forgotten how I found out about it. It sat on my computer until the other day when I was looking for something to listen to driving to work. Steven Pressfield writes military novels but for most artists he's probably better known for his book, The War of Art: Break Through the Blocks and Win Your Inner Creative Battles . It was a wonderful interview. He talks about resistance to doing the things you want to do and how to overcome it, as well as some of his own experiences. It was a lively and inspiring interview, with just a bit of woo-woo. I ended up listening to it a couple of times. I'm off to work on Workshop 2. Going with my word for the year, Courage, I decided that I would learn some new techniques and try some new things this year. Since Strathmore (the artist papers folks) are offering some free workshops to go with their new Visual Journals, I decided to start the year with the Recycled Journal Pages Workshop. Not only has it been lots of fun, but the page shown above has been featured in the Strathmore Winter 2011 newsletter, on their blog, and on their Facebook page. 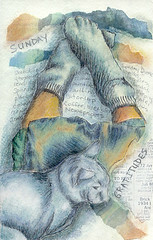 Plus I received a pack of their Ready Cut Watercolor paper. It comes in standard sizes to fit readymade frames and mats. I received 8 x 10 inch hot press paper, a nice size to use, with 10 sheets of 140 lb paper. So how cool is that! 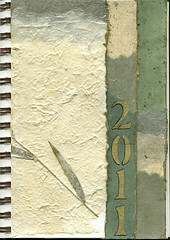 In the Recycled Journal Pages Workshop, you work on one page over a period of four weeks. I'm actually working on two pages. I have always kept a sketchbook, or actually more like a creativity journal since it has notes and thoughts as well as sketches. This workshop uses copies of your old pages to make new pages. It's been a fun workshop and I've leaned some new techniques from it. Life got in the way, so I still need to finish weeks 3 and 4. That's one of this weekend's goals. 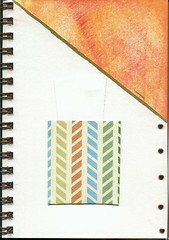 The workshops are self-directed so you can still start the Recycled Journal Pages Workshop. More on my pages from this workshop later. I know, I was in the middle of art every day in November when I kind of dropped off. Okay, so it ended up being art every other day. The painting above was my last one for November. I will blame it on last year's word for the year, Abundance. For the past couple of years, I've chosen a single word to guide me for the year instead of a set of New Year's resolutions. I have to admit there was plenty of abundance last year. There was happiness, depression, anger, laughter, work, struggles, celebrations, nervousness, new obstacles to overcome, new routines to learn, new jobs to learn, new friends, and much more. It seems like much more than one year has gone by. By the time November rolled around I was exhausted and feeling like I had a little too much abundance. Okay, an abundance of money would have been a nice touch but I had enough money. While I kept up with my art, there was just too much going on in my life to do as much as I wanted. Overall it was a good year and I had a lot of fun, but I'm ready for a little less abundance now. My word for this year is Courage. It's the simple things that often give me trouble. Moving to another country by myself is a piece of cake. Picking up the phone to call someone can be terrifying. My dislike of phones is notorious. So it's those little things I would like to work on this year. I almost chose Release for my word. There's a lot of stuff I need to release and it would work for releasing my fears too. So I guess I'm keeping it as secondary word. So far the year is off to an excellent start, so I think I've made a good choice. So it started out as art every day month. Then it became art almost every day month. Then it became 30 pictures in 30 days. Now I'm back to art most days (most being more than 15). Hey it's been a good experience though. Numbers 11 and 12 are sketches from some photos I took a few years ago at the Atlanta Zoo. The one above is a gorilla. 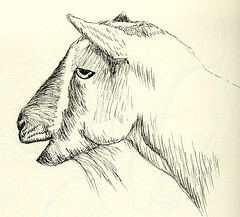 The one below is a goat from the petting zoo section. Both are done in ink. 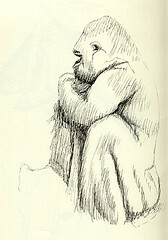 Recently I bought How to Draw Animals by Jack Hamm. It's a small book but it's packed with good information. A lot of space is spent on structure and comparing the structure of various animals. Heads, feet, eyes, ears and noses are compared. It discusses how to use a house cat as a model for a big cat. I've found it very helpful. 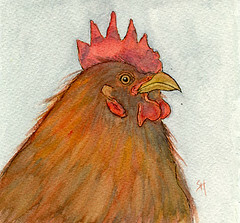 I've had a huge urge to paint chickens lately. I blame Roz and Jean Haines. I didn't have any chickens or chicken photos of my own (Wait I just might have a few chicken photos. 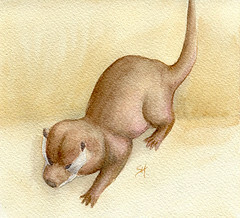 ), so I browsed around morgueFile to find one. This chicken was fun to paint. I can see more chicken paintings in my future. Well I kind of crashed and burned last week with Art Every Day. I had a couple of really busy days which led to little time and a need for sleep. Then I got discouraged because I didn't do art. But I decided to try and make up those days so expect things to be badly out of sync for a while. 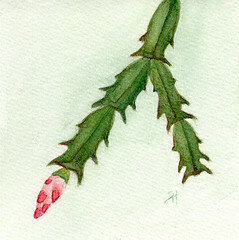 Day 7: It looks like my Christmas Cactus is going to be a Thanksgiving cactus this year. I noticed the other day that it is full of buds. I neglected it for a while this summer so it's good see it's going to bloom anyway. 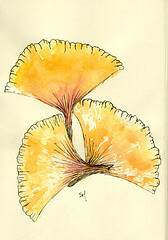 Day 8: A quick little leaf print with my gingko leaves. They were actually a little too dry to do prints at this point, so I decided to highlight the leaf shapes with ink. 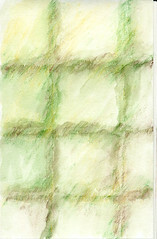 Day 9: The other things I've been doing with some of these paintings is trying out some watercolor paper samples. The paper here was not one my favorites but it turned into a nice little painting anyway. 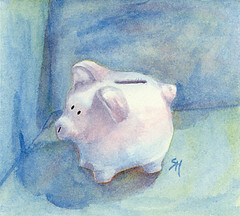 I'll have to try painting this little pig again sometime. I love the reflection of colors on this little guy. All images and text are copyright 2009 Sydney Harper, unless otherwise noted.